That’s a direct quote from my recent interview with Abe Somani, Global CEO, LEVERTON, one of the smartest real estate startups on the scene. It was a great conversation where I got to learn more about LEVERTON and also Abe’s really incredible professional journey. One of the things that I think often gets overlooked in the analysis of the CRE tech space is that we focus (starting with yours truly) too much at times on specific companies and not enough on the underlying technologies. I personally believe that the real future of the sector is probably going to be more about specific applications, rather than specific companies. It’s not to say that companies won’t be leading the charge, of course they will. Technology is only as good as the company building it, marketing it, etc. But I do think it will all be about the application…the underlying technology that empowers all of the major advancements in the CRE sector. Whether it’s AI, AR, voice commands, facial recognition, robots etc. There is going to be a wave of innovation coming to CRE that will impact much of how data is collected and analyzed, how people work and communicate and how properties/technologies are built and transacted. And to me, AI is what will power all of the great advancements in commercial real estate tech. And as I have written about previously, I think that the areas that tech will be the most impactful in the short-term will be HOW we work with AI taking over many of the manual tasks such as research, data, analytics, marketing, communications and so more. This is also going to have a pretty significant impact on jobs how in the commercial real estate industry. So, in order to understand AI and grasp it’s potential impact, I went to the expert. If you don’t know Abe or LEVERTON, you need to. They are on among the most innovative companies I have connected with in this space. Michael Beckerman: What is your role at Leverton and what attracted you to the company? Abhinav Somani: I am the Global CEO of the LEVERTON group companies. I was attracted almost immediately by the opportunity to scale a tremendous technology for a use case that seems so simple, yet vital to any corporate decision-making process. The AI platform is clearly a next generation technology that is going to be adopted more and more every day and I wanted to be at the forefront of that emergence. MB: Can you describe the company…how big is it today, where is your funding from, and what does the site do? AS: LEVERTON is a market leading, software-as-a-service platform that utilizes A.I. to automatically pull structured data out of unstructured corporate and legal documents. Driven by machine learning technology, the platform automatically extracts, structures and manages key data from corporate documents in more than 30 languages. The platform currently supports over 6,000 users worldwide who are looking for more efficient and effective data management processes that provide valuable insights from structured data. We operate out of our offices in Berlin, London, New York, and Dallas with more than 90 employees from 27 different nationalities. We’ve raised capital from our family office investors, DAH Beteiligungs GmbH (‘’DAH’’) and Anyon Holding GmbH (‘’Anyon’’), who support entrepreneurs and early stage startups that shape innovative property technology and real estate concepts. MB: AI is something we read about daily. To someone who just flew in from Mars, how would you describe AI? AS: AI means machines that imitate human capabilities, such as driving cars, reading text or playing chess. On a more granular level, AI is based on the idea of programming algorithms that replicate the functions of neurons in the human brain, mirroring the ways in which a human brain operates and behaves through what is called a neural network. And in order for the machine to replicate the human brain’s ability, singular tasks need to be identified and specific directives need to be given. You train the machine by giving it examples, similar to teaching a child, in order for the machine to recognize the correct patterns and know the difference on its own. MB: How do you see AI transforming the commercial real estate industry? AS: AI is uncovering innovative business models that enhance the quality and efficiency of the data being gathered, especially in the property management space. In a nutshell, it is simplifying tasks such as manual review of complex leases. Anyone who has ever reviewed a complex lease understands that the process requires a lot of effort. AI can easily identify and understand the complexity of real estate leases in any language, which is a huge benefit for the management of global portfolios. AI can not only gather data, but seamlessly integrate the data gathered into any ERP system, meaning the data being entered into the systems are error-free and don’t require manual inputs. For large organizations, the availability of clean data within their own systems makes forecasting and reporting significantly easier. Accurate data provides crucial insights and therefore helps in making smarter business decision about real estate portfolios and liabilities. Eventually, AI will start to mine and garner insights from this data itself taking on a new manifesto – that being to not only accelerate the collection of data, but also to understand that data better. MB: How could you envision a day in the life or a real estate professional in the not too distant future being impacted? AS: A lot of the regular day-to-day work will soon revolve around data collection and its analysis. For a realtor, analyzing information regarding potential prospects will lead to a better understanding of their needs and also aid in anticipating next steps. Looking at the larger picture, structured data will become immensely valuable to real estate professionals in mitigating risks and forecasting market trends. In addition to being more data-driven, adopting newer technologies, evaluating the right ones to implement and finding innovative ways will play a key role in the life of real estate professionals. They will need to be more tech-savvy as virtual tours and advanced visualization models will become a mainstay in the prospective buyers’ decision making process. MB: Who are your customers and what are some of the use case examples? AS: Our customer base is varied from small business to large real estate owners, investment firms, brokerages, capital market firms, retailers, accounting firms, global law firms and a number of Fortune 500 companies. Many of these companies look for a centralized repository of data where all crucial information from across multiple jurisdictions can be made available instantly, in order to make their portfolio management and decision-making processes more efficient. Our most recent engagement with UK’s largest sporting goods retailer, Sports Direct is a great example of this. By deriving key data from leases in multiple languages, across various regions, crucial information can be easily accessed and interrogated, helping the business get a clearer picture pertaining to all their assets, all in one place. Examining lease documents can become much faster. The same goes for legal due diligence, tradition-steeped global law firms are now leveraging deep learning technologies to accelerate real estate transactions. What has previously been a time and resource intensive process is now being automated to pull important data points such as rent charges, break options and overhaul clauses quickly and efficiently. The process can be up to 75% faster than a manual review. MB: I read recently that half of all jobs are at risk to AI powered automation. How can people prepare for this future and what jobs are most vulnerable? AS: We are currently in a period of so called ‘soft’ AI which means that technology is used for specific, niche tasks that are improving certain business processes, so that humans can spend their time on more creative, value adding activities. We are still far away from an apocalyptic scenario in which AI replaces humans and takes away their jobs. AI in its current state is only limited to a set of tasks and still heavily relies on the human input to provide context, frame problems or generate hypotheses. But what I see coming is that some of the more mundane work of humans are and will continue to be outsourced to AI to be enhanced. The legal industry is a good example. Only a few years ago, documentation review was an exhausting manual process, prone to errors due to factors such as tiredness and distractions. AI doesn’t get tired, nor can it be distracted, therefore can significantly improve these manual tasks. Working with and witnessing many of our customers, both global law firms and individual lawyers use our AI solution made me realize that the best people can do to prepare and embrace the future in which AI plays an irreplaceable role is to see it as an extension that can make life easier. The first part of preparation is acceptance. Accept that if you see your job or your tasks being taken over by AI in the near future – don’t wait for it! It will come so start to ask your employers to provide training to you in order to learn new skill sets such as data mining or data analytics that will make you a more valuable player even once AI is introduced. MB: What’s next for Leverton? AS: Our focus in 2018 will be to continue to look for innovative ways to improve our platform, keeping in mind the needs of our customers. All while, structuring large amounts of unstructured data with a stronger and improved AI, expanding our data extraction services to other document types, and working on creating more integrations with other platforms and ERP systems. One of our most exciting new projects will be a recommendations engine. We will be looking at the data aggregated by our AI to help our customers further make correlations between their data and providing vast new insights. In the near future, you will be able to ask the LEVERTON platform a question, similar to using Siri on your iPhone. Whether it be questions related to a real estate lease, employment contracts, or any other type of document. These documents could even be in completely different languages and the recommendations engine will be able to compare them and homogenize all the data. We’re really excited about 2018 and beyond and can’t wait to see what other emerging technologies disrupt our space! Abhinav (Abe) is an experienced investment, financial, technology, business development, and operations strategist. He is currently building the global LEVERTON platform, the next generation of artificial intelligence based machine and deep learning algorithms for data extraction. Abhinav works with his team to develop corporate strategies, implement sales strategies, manage partnerships, and foster customer relationships. 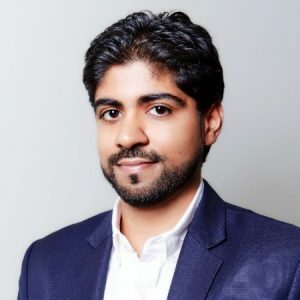 Prior to LEVERTON, Abhinav was an Associate at ICV Partners where he worked rigorously with portfolio companies to improve their sales, enhance marketing, turnaround ailing business segments, and increase operational inefficiencies. He worked directly with CEOs, COOs, and CFOs, using data-driven metrics and analyses to increase profitability and grow businesses. He has also looked at hundreds of investment opportunities, conducted countless financial analyses, and is well versed in the ways of the institutional investment community. Beyond this, Abhinav is an entrepreneur and leader. He co-founded The Manhattan Project, NYC and the East Coast’s largest not-for-profit Bollywood dance production, operating it for 6 years. He is very passionate about music, media, and the arts as he continues to DJ and produce music under the alias “B-Nasty”. He also volunteers as President of this fraternity’s endowment fund and sits on the Board of Directors of 16 Park Avenue. The article was originally published on CREtech.com.